That they don't serve breakfast in hell." Oldie from the Newsboys, melody by Peter Furler, lyrics by Steve Taylor. Saturday Song #2: "Kiss Me"
Primarily known as a Christian band, Sixpence None the Richer took their turn at this sweet little love song. Leigh Nash's vocal is perfect. Saturday Song #1: "Someone To Watch Over Me"
Like the Beatles' 'I Will,' this George and Ira Gershwin tune is a love song to some unknown love. But this version by Frank Sinatra from the 1950s is so plaintive and emotional that Old Blue Eyes seems to turn the words into a plea to a very particular woman, someone he misses desperately. Or maybe he misses the chance at love with her he never had. George Gershwin, of course, is one of the musical giants of the twentieth century. But the lyrics by his older brother, Ira, are always amazing too. After George's untimely death, Ira continued to his work as a lyricist with other composers. A McCartney song from the Beatle's "white album." It's a love song to one who isn't yet a love. As mentioned a few days back, you need to add Peter Furler's new CD, Sun and Shield, to your music collection. This is Track 3 of that set. Now, go to i Tunes or Amazon and have your faith and spirits boosted by getting this LP. [With obvious reference to Hebrews 11 and to 1 Peter, among other passages of Scripture:] "[As a Christian,] I must keep alive in myself the desire for my true country, which I shall not find till after death; I must never let it get snowed under or turned aside; I must make it the main object of life to press onto that other country and help others do the same." For the Christian, the hope of heaven isn't an escape from the realities of this world; the hope of heaven gives believers the power of heaven to face life in this world. Those few words weren’t meant to constrain a young man from growing and being transformed by his life and experiences and the things he would learn in college. They were meant instead to remind him of his birthright, of the love of his family, and the character that had been forged within him in the first eighteen years of his life. "Don’t forget the person you have become before this day." "Don’t forget your identity when you face the disappointments, tests, and even temptations of adult life." "No matter the changes that lie ahead, keep drawing on the strength of who you are." This, in a sense, is the message that the apostle Peter gives to the Christians living in first-century Asia Minor, which we find in today’s second lesson. “Never forget who you are as people saved by God’s charity--His grace--through your trust--your faith--in Jesus Christ,” Peter is saying. The Christians to whom Peter wrote needed that reminder. They were facing some sort of persecution. What it was exactly, we can’t be sure. But whenever Christians face opposition in the world...whenever there are people telling us that faith in a risen Savior is foolish...or the world claims that living life God’s way, rather than the world’s way is naive...or when people tell us that when you’re dead, you’re dead, Christians desperately need to remember who they are and how they came to be who they are. It’s in the remembering, that we can be re-membered to who Christ has made us to be. Spiritual milk here is the word about Jesus, the word that God’s heart breaks at the thought of losing any one of us because of the sin we inherit at birth and so, He decided to become a human servant among us to die and to rise and to give a new and eternal relationship with God to all who repent and believe in Christ. We never grow so old or advanced in our faith as to not need to keep craving the life-changing power of that word. I once met a couple who had both grown up in Christian homes. In fact, both were preachers’ kids. But they’d forgotten who they were. They stopped feasting on the message of hope in Jesus. They’d both made a lot of mistakes. And, contrary to the will of God, they were living together without benefit of the marriage covenant. Listen: No matter how far you and I may wander from the God we know in Christ, no matter how little room you may think you have for God in your life, He always has room for you. It’s a matter of remembering who we are as the result of our Baptism--children of God--and craving for the power of the Gospel to be at the center of our lives again. Keep craving the spiritual milk of Jesus and His Gospel, Peter says. The message that changed you from God’s enemies to God’s friends will also keep your hope and confidence in God alive. Remember who you are. In Jewish and Christian thought, “the Stone” was another title for the Messiah, the Christ, the anointed king and savior God promised hundreds of years before the birth of Jesus. Psalm 118:22-23 had predicted, in fact, that the world would reject the Stone, would reject Jesus. The reasons people rejected Jesus then--the reasons that people reject Him today...the reasons I once rejected Him--boil down to really just one. As a friend once told me, explaining why he wasn’t a Christian: “I want to build my own life and I don’t think that Jesus can do that for me.” He might have said that he didn’t want Jesus to build his life because the moment you let Jesus take over building your life is the moment you cede control of the direction of your life to Him. Jesus will take those who turn to Him away from death, toward life. Away from separation from God, toward fellowship with God. Away from futility, toward purpose, meaning, significance. When, throughout our lives as followers of Christ, we lay down our sinful rebellion, remembering who who we are by God’s grace and surrendering to the truth that the One Who made us and bought us back from sin and death through the blood of His Son might have a better idea of how we tick, we experience peace. When the life of the living Stone enters into us, we become living stones--or, as Martin Luther put it, we become little Christs--the life death, and resurrection are re-enacted within us. 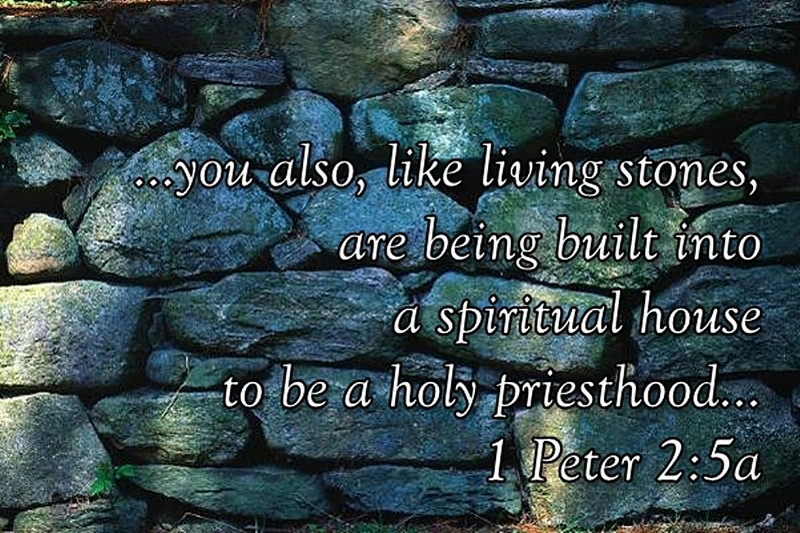 In verses 6 through 8, Peter quotes several passages from the Old Testament about the Stone, the Messiah. The upshot is that those who obey the message of the Gospel--who believe in the the good news of Jesus Christ--live. But those who disobey it--who refuse to trust the God Who, in Christ, holds the outstretched hand of love, forgiveness, and new life to all who believe, stumble over the living Stone. By the way, Peter isn’t saying in verse 8, that some people are destined to be saved, while others aren’t. He’s saying that those who refuse Jesus are destined for separation from God. If you’re drowning in a flood and refuse the help of a rescuer, it isn’t the would-be rescuer who sealed your fate, your destiny. When you get caught up in the problems and controversies, the tragedies and temptations of this life, when sin gets hold of you and threatens to pull you under, remember who you are: You are God’s people. Christ died and rose to make it so. And He’s given you a mission, a purpose for living: You’re to pass the message on about how God called you from the darkness of sin, death, and futility to live in the light of His love and power permeating even your darkest and most difficult moments. Once, Peter says, we were not people, nobodies, phantoms roaming this earth without hope. But now we are people, somebodies, children of God called by name by God. Our names are written in the book of life for eternity. That’s Jesus’ promise to you and me. And it’s worth remembering and worth re-membering ourselves to Christ and His body, the Church, every moment of every day.